There are plenty of twists and turns in both books I read in this series as well as some belly laughs. Of course madcap mayhem follows Georgie Shaw as she tries to keep up with her own personal life and that of Mad Max--the genius creator of Marvelous Marley World. Of course one never knows what Mad Max will do next and his mood swings keep everyone jumping! Murders abound and the culprits must be found without alerting the people visiting the park. Georgie is management--but she is also kind of in charge of food (she started at Marvelous Marley World in the kitchen)--the recipes--ah yes--the recipes!! "Welcome to my world--Marvelous Marley World! It's not always so marvelous at the 'cat factory,' an entertainment empire founded on the incredible success of Catmmando Tom, a cartoon cat. There's never a dull moment 'working for the cat,' as we like to say around here. Sometimes that's because of my boss, 'Mad' Max Marley who can't always curb his enthusiasm or his blustery temper. He knows that. I've told him enough times. I have to give him credit, though, Max always goes for the gold, aiming for five-star entertainment, hotels, and cuisine. Trained as a chef, I'm there to back him up about the food, even now that I'm a member of management. A creative genius, Max Marley is Walt Disney, and Dr. Seuss rolled into one. Catmmando Tom is only one of the fantastical characters that inhabit Marvelous Marley World. Life is often stranger than fiction, though, isn't it? Some of the most outrageous characters around here are the real ones. The most intriguing stories aren't always the ones created by our movie studios. Come! Join me for all the mayhem, mystery, and even murder. Get to know Jack Wheeler, the handsome detective who walks into my life under the most unusual circumstances. Meet my Siamese cats, Miles and Ella. Food, too! Recipes included. Cheers! 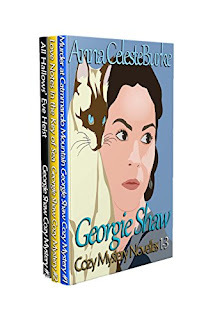 Georgie Shaw"
Murder at Catmmando Mountain Georgie Shaw Cozy Mystery #1 (I really have to get this one and read it! Book #6 Murder of the Maestro will hopefully be out by Christmas! To be honest I do not remember reading.... my memory is poor. I haven't read any of her books, but I would like to start at the beginning and read Murder at Catmmando Mountain. I really love a good mystery. Thank you. I have not read any of this author's books yet. I might want to read Cowabunga Christmas. I've read and loved all of Anna Celeste Burkes' books. Unfortunately, I haven't had a chance to read any of Anna's books yet. I would like to start with "Murder at Catammando Mountain". I have read Cowabunga Christmas and Gnarly New Year. I have 6 others to read. I would like to try Heinous Habits. Thank-you for the chance. I haven't read any of Anna's books yet. I have one, All Hallows' Eve Heist, on my TBR list but I can't read it until I've read the others in the series. I am OCD about reading everything in order LOL. Doesn't matter if it's a series or not. I have to read the books in the order they were written. That way you see how the author grows as a writer and how their writing style changes over time. 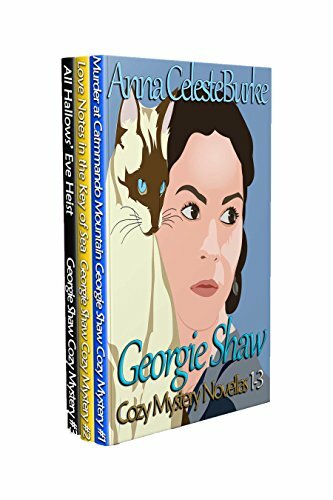 I've read all of the Corsario Cove books--including Heinous Habits and all of the Georgie Shaw books. I own all of the Jessica Huntington books but haven't had a chance to read them. This is a new author for me. I would love to read Cowabunga Christmas. I have pre-ordered the set and look forward to reading it! I have a few of her other books on my Kindle that I haven't read yet. I love her books and have read a few! Loved her cat story! Been there but not around my computer luckily!! I read her, first, in a homocide anthology, then went to her amazon page and looked. Actually had won some amazon gc $ and after reading through the first book on kindle unlimited stopped and went to my account and bought all the books out at the time, and afterwards pre-ordered the others so to date have read all the books in all 3 series, inclduing the one that is currently only available at this time in the summer collection. Thank you for the giveaway! I'm reading Murder at Catmmando Mountain and really liking it! I'm really looking forward to reading Heinous Habits! I have read several of Anna Celeste Burke's books. I am most looking forward to reading All Hallow's Eve Heist. I'm totally new to this author, but love checking out new ones. I have actually read all of the books in the series. I have enjoyed them and would definitely recommend this great cozy mystery writer! 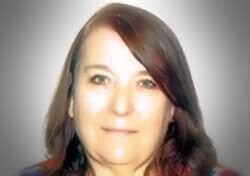 Sheila Siarkiewicz says: I have only read one of her books...Murder at Sea of Passenger X. I enjoyed reading it and would like to read more of the Georgie Shaw cozy mysteries. I have not read any books yet but I would love to read All Hallows' Eve Heist. I have not read these books but I do love cozy mysteries and am intrigued by the stories. Sounds like a great series. Thanks for the opportunity. I have not read any of her books yet but I would love to read Murder at Catmmando Mountain. I have not read any of these books yet but I'm definitely going to. The 3 book set sounds like lots of fun. Anna is a new author for me, so I have not read any of hers yet. Oh they all look so good! I think in the set I am really excited about Love Notes in the Key of Sea Georgie Shaw Cozy Mystery #2!!! I have not read any of them yet but hope to very soon as they sound awesome! all hallow's eve heist sounds really good i'm not sure if i have read any of her books yet. I have not read any of her books. I am interested in reading All Hallows' Eve Heist. I haven't read any of her books, but I'm interested in Murder at Catmmando Mountain. I haven't read any of her books, but I'm looking forward to doing so! Murder at Catmmando Mountain sounds fabulous! All stories look great! I always like to start with the first book in the series, so I'd choose Murder at Catmmando Mountain. I haven't read her books yet. I am playing catch up all the time now! I'd love to read Murder at Catmmando Mountain first. I haven't read any of her books. I would like to start with Murder At Catmmando Mountain.